A fun and colourful project. The challenge is choosing the best colours and arranging them to obtain the best effect. How you use the hairdryer and the tilt of the board makes a huge difference to the result . It’s a good colour mixing and coordination and thinking project. A good hairdryer …we use one from BOOTS . We reckon that if a hairdryer can withstand daily normal and being used by Lizzie Witch on a regular basis for a couple of years it must be good! Crayons …we used Crayola and Bic crayons . Both are good. Some pictures look better with the paper left on. Others are better when the paper is removed. Some card to test out the process before doing the real thing. Glue to stick the crayons to the canvas. We used BOSTICK. Cellotape can be used as an alternative to glue but fiddly. Try using card and small bits of crayons for the first few runs. This is cheaper and will enable the child to see what happens and to decide which colours to use and how to arrange them. Don’t overdo the hairdryer bit! Kids will want to carry on and on until every bit of crayon has gone but as in a lot of art, less is best! But it’s a good idea to let them have their own way during a practice run on card! Learning from your own mistakes is the best way and hopefully they will see that controlled melting is more effective. You could suggest trying both and then comparing the results. Ask them to predict what they think will happen. Which colours will mix? What colours will this make? What will happen if you point the hairdryer sideways? What will happen if you point the hairdryer over the top of the crayons? 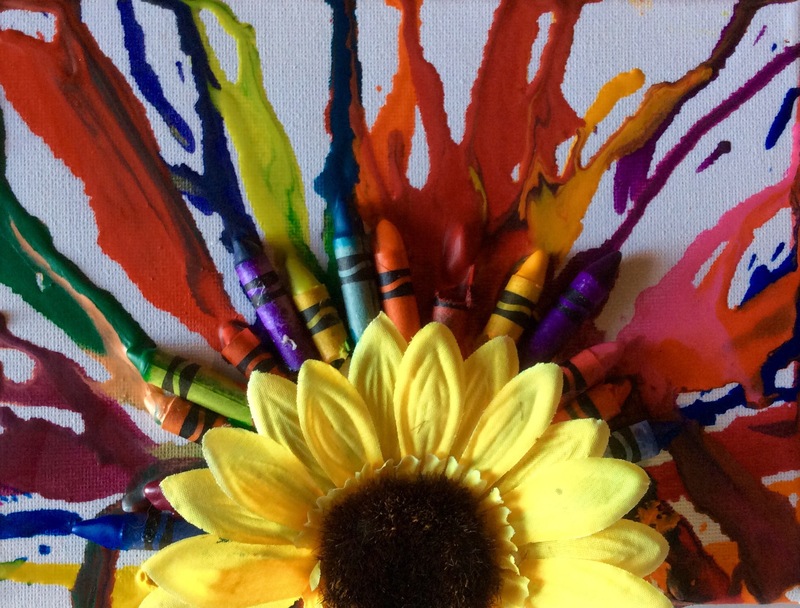 Make the melted crayon look like a tree full of dripping blossom ….you can paint or stick a tree trunk on the canvas before melting the crayons. Make a picture of someone blowing bubbles ..a few grated bits added helps. Make the melts look like rain …draw or stick a person with an umbrella on the board. The crayons do splatter a little so do cover tables well or do outside using an extension lead. This is a project for children old enough to hold a hairdryer confidently. Probably around 7 years and up. As with all of the Jumble Fun projects, adult supervision is advised. An adult will be needed to cut the crayons in half unless you use a big canvas board and then they can be stuck on intact. The video is fun to watch and shows the basic process. Use it as a stepping stone from which the child can develop their own ideas.